Everything below from the original post still applies. The link immediately below is for a MS Excel 2010 version so you don’t have to put up with “compatibility issues” of the old log. I hope you’ll like it. The MS Excel 97-2003 version is far below if you’re still using that version of Excel. 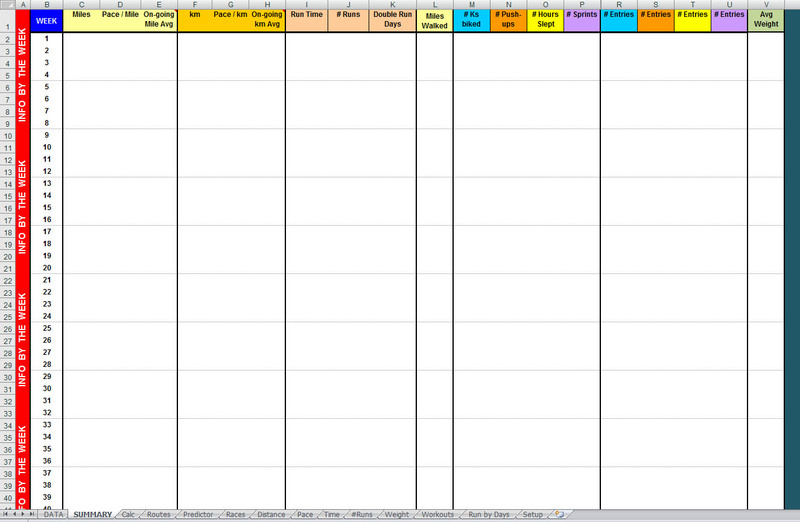 This is a much updated version of the year long Excel spreadsheet running log I had posted two years ago. You may want to refer to that post for some instructions. Thank you to all of you who had downloaded it, used it, suggested improvements and recommended it to others. If you liked that log, I think you’ll love this one! This new log has some great features I think you’ll love like a spot for your training plan next to what you did. While the focus is on running, there is room for other exercises and things you might want to track, like sleep, injuries, supplements, heart rate averages and maximums, etc. There is a race predictor using Jack Daniels’ running formula, with a short, simplified, but effective and practical explanation on how to use it. 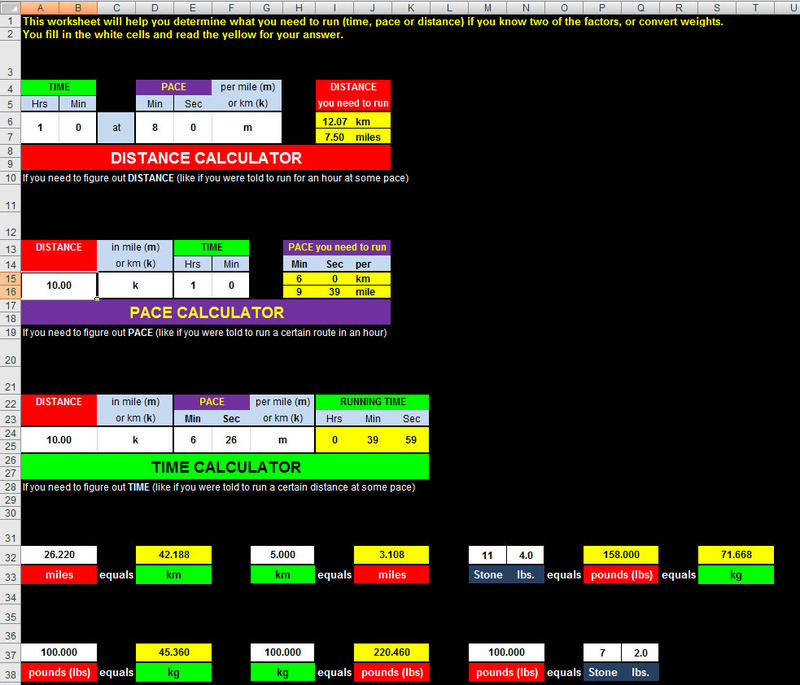 There is a calculator to determine any of time, distance or pace you need to run if you know 2 of the 3 variables. 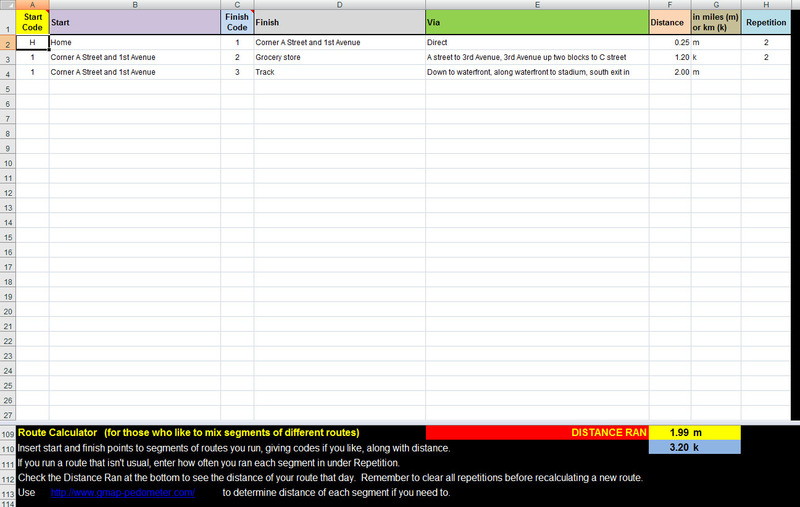 There is also a routes table to help calculate routes you take that are not your normal ones, but piece together bits of various routes you have ran. There is no new “summary” feature where what you input is number crunched, but that was because I didn’t perceive the need for any. Otherwise, most cells you shouldn’t touch are still locked up, but you have the ability to manipulate some partially for your use, like if you write a long comment one day and want to show it all rather than have some of it hidden away. As you use this spreadsheet, change the view size if the info is too small for your comfort. It can be at least twice as large. Don’t strain your eyes over using this or feel like you have to put on glasses to use it. You’ll use it less frequently for every little annoyance like this. The best way to see all this is to jump in so here goes! There are a lot of features to this log so don’t be intimidated by all the description. You need very little instruction to start and the rest should be pretty intuitive once you get going. 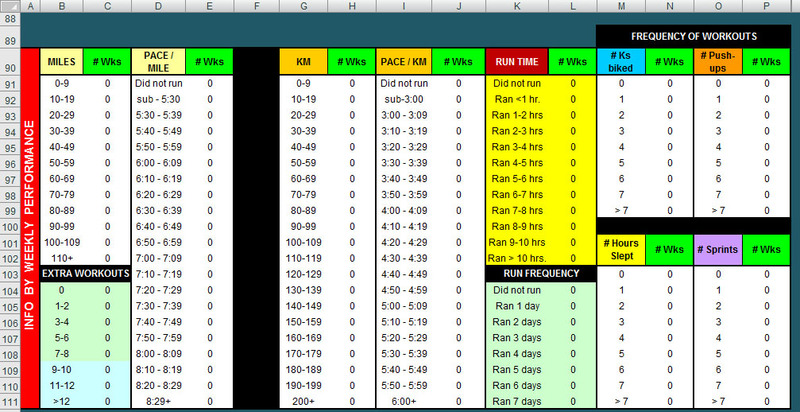 Please click here to download the Advanced Excel Running Log by Minh Tan, 2011 version 2 (2.1 MB) The file is MS Excel 2003 version for greater compatibility for people. If you use a version later than this, please do a Save As and choose the latest version so you won’t get the “compatibility” pop-up each time you close the file. When you first open the file, it will open to the SETUP worksheet. You need to follow the instructions here first before you can do anything if you want things to work properly. You can go back here to set up more information as you determine it. After this, wherever you close the file after you use it, is where it will open up the next time you use it. 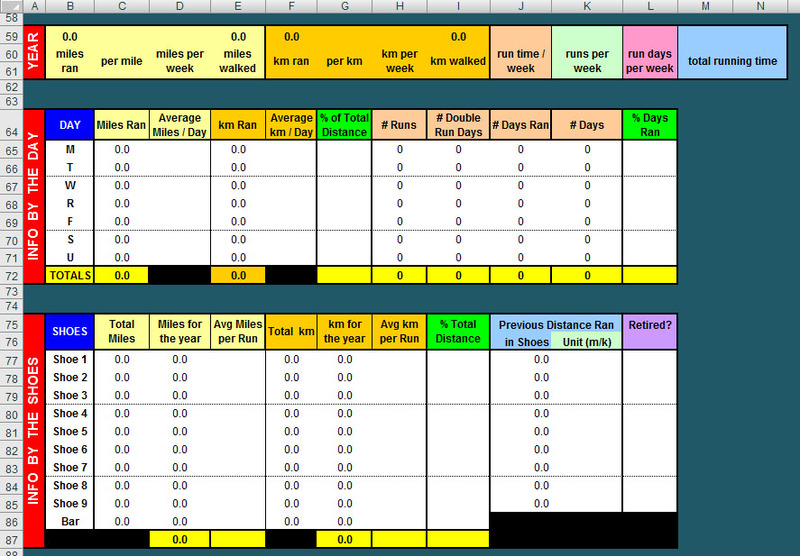 The DATA worksheet is where you enter all your workout data. There are two things you definitely need to know about this worksheet. 1. There are a lot of boxes for information, with some guidance. Use them as you need if what is provided is not sufficient, especially for information like intervals and such that are not calculated and just meant for record keeping (examples later). 2. You need to enter something in the Distance Ran column for each day that passes (more below). The log determines where you are in the year that way to properly give you your summaries. A “0” (zero) entry is just fine. To the very left are are few columns to track the weeks and date. Date is optional. Then comes the green header columns that is your planned workout. If you’re training according to a schedule or plan, you can enter it to save from having to go back to a book, photocopy or wherever you keep that information. There is room for distance, pace and time, whichever you choose to fill in pending how your plan works. You may need to run 10 miles one day, an hour the next on an off day, and 10K at a certain pace on a harder workout day. These are not calculated other than a sum of your weekly distance at the bottom of each week to give you an idea of mileage load. If you need to work out something, check out the CALCULATOR worksheet part further down this post. Finally, there is a space for any notes you need to make for yourself regarding your workout. You get 2 workouts per day from this log, though it is not recommended you use them both everyday! 🙂 You may notice there is a Week Zero in the graphic. That’s residuals like the first few days of a year or your training that do not fit into a full week and could mess up your average. 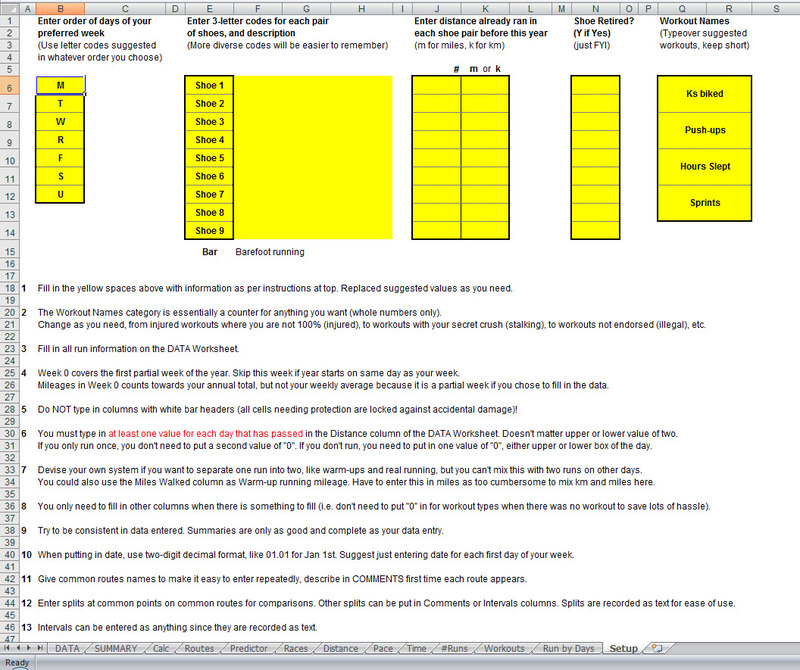 It is further explained in the Setup worksheet. To the right of your planned workout are three blue header columns (two headers, 3 columns). Put in your distance ran (#, then mor kfor miles or kilometers, respectively), then your time in the format shown. The two white headed columns to the right will calculate your pace per mile and kilometer once the information is in place. You need to fill in a distance for each day (just 1 distance, not 2 necessarily), to tell the log how far along it is in your usage. As you move to the right, the worksheet will scroll, but keeping the days at left and headers at left so you don’t get “lost” in the grid. To the right of your pace calculations are other details from your run like how much high intensity time you ran. This is for people who warm-up and cool down but don’t want to count those parts as separate runs. This “time” value is not summarized in any way. Just for you to know. There is a CALCULATOR worksheet where you can do some math with it to get distance and/or pace, but you keep that in your notes. Otherwise, use one of the other workouts the sheet tracks to track the two part of your run separately. Maybe record the high intensity in the Distance Ran column and track warm up and cool down mileage in one of the “other workouts”. Those “other workouts” can be set up in the SETUP worksheet. You can put in a shoe code you designate for each pair of shoes if you want the log to keep track of mileage you put on your shoes. In Run Routes, use names you give to various routes, or describe them, code them, whatever works. There are room for 3 splits and 10 intervals, like if you did sprints or fartleks as part of the workout. These are just for your note. They are not number crunched in any way. With the two workouts per day, if you only do intervals for one, you can always write distance in one box and time below it, or vice-versa. Be creative with the boxes if you don’t use them all as intended, but need extra spaces otherwise. To the right of all that is two columns with red headers for average and maximum heart rate (HR). You can enter data there but there’s no value to number crunching them for anything. You can look at the trend down the spreadsheet if you want to analyze anything yourself, like compare them for two similar workouts in different conditions, or later in your training, etc. A long Comments box allows you to put any comment you like about your run. To the right of the Comments is a separate column I dedicated to that most unfortunate, but important, part of comments we should track, which is injuries. This saves you from looking through your comments for injury notes, if you put it where it should be. To the right of Injuries are columns for non-running exercise you do. The wide cell is for descriptive stuff. The other cells will have headers you input on the SETUP worksheet, and these should be numerical. They can be anything you want to track that is numerical, whether it is sleep, which is very important, or kilometers biked or push-ups or whatever. To the right of injury notes is miles walked. I kept it just in miles to be simple. You can use the CALCULATOR worksheet to convert to kilometers if you like. I just find it easy to estimate quarter miles or 400m roughly in my estimates of how much I walk. Some people spend a lot of time on their feet so this is useful to record as it may impact your running, no pun intended. The SUMMARY worksheet tabulates your total in both miles and kilometres so you can get an idea there. Then comes 4 columns for “other workouts”. In reality, these are anything you want to record and count, which is why I have example categories like “sleep”. You set up your own in the SETUP worksheet. You can record these “workouts” as volume, like how many push-ups, or frequency (insert a 1). You can even use this to keep track of supplements you take for up to 4 supplements like Vit A-D, putting a 1 for each day you take each. Be clever in how you use this for your needs! The column for your weight is next to last. You choose the unit you want to put in. All it cares is the number so systems like kg and pounds work since the numbers just get bigger like the way you count. Systems like stones don’t, but there is a converter in the CALCULATOR worksheet to either pounds or kg if you want to use it. Your weight is graphed by average per week, from the average at the bottom of each week, in the WEIGHT worksheet. Just a word of caution, though. Beyond losing some initial weight, you’ll level out and may not meet your set goal if you didn’t set a realistic goal for your body type, age, gender, etc. Weight is not the ultimate indicator of health. Finally, a little spot for supplements taken. This worksheet summarizes a lot of things for you. 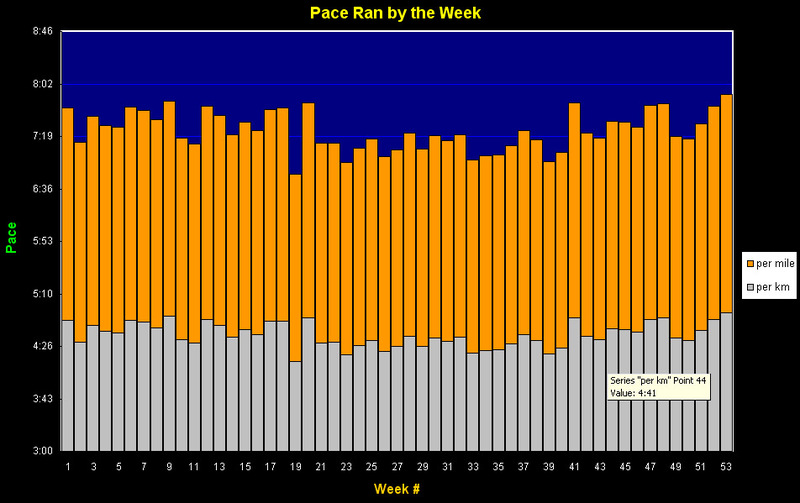 The weekly summaries include the obvious like distance, time and average pace ran. There is also a running average, if you’ll forgive the pun, that is the up to date average per week for the year. Your 4 other workouts are also recorded for totals, as well as the number of entries of each. For example, you might have done 200 push-ups in 5 sessions that week, so you’ll see the 200 as well as the 5. Pending the workout, sometimes frequency is more important than volume. The ongoing averages and totals for these extra workouts are at the bottom of their columns. These summarize the type of week you had, like how many weeks you ran 30-39 miles, how many 40-49 miles, how many with 5 workouts of a certain type, among all kinds of other stuff. Just in case you’re interested. I think it’s good and useful to know. The Calculator is really easy to use. Pick your conversion, enter in the white cells. Look at the results on the connected yellow cells after you hit Enter or Tab or move away from your cell. If you run in the city where you segment lots of streets and areas, this will be great for you. Measure point to point distance once and record it. There’s a link to G-maps Pedometer to help you with that if you so wish to invest the time. It’ll be worthwhile because you can paste the data here into a blank spreadsheet next year if you come back here to download another blank copy. When you run a route, put in how often you ran that segment (like 1 for once, on the way out or home, or 2 if twice like both out and back, and so on). The tally at the bottom tells you the total distance of the segments you indicated you ran! Of course, on your staple routes, you won’t need to do this time after time. You’ll know the distance and just give it a name on the DATA worksheet. But for when you deviate, or piece together routes, this I have found to be very useful. Finally, keep in mind that cities with grid street layouts have pretty much the same distance for parallel blocks. That way, you don’t need to enter the distance for the same 5 blocks on 45th, 52nd and 71st streets, say. Just use one as a guide. It’s not like the distances have to be super exact cause you probably can’t whiz through them all like in a race where pace and time really matters that much. Don’t be intimidated by all the numerical tables which stretches below the view shown here. This is part of Jack Daniels’ Running Formula (lots of detailed explanation and usage instructions in the link). I just have simple, but effective, instructions with this worksheet below the tables. It’s a way for you to see your fitness level over various distances, and maybe set targets for improving on others, with caution that the course, weather, how you feel that day, etc. can affect your real result. But it’s nice to have a scientific guide. There is room below the instructions for your notes as you work with the table over time and different races. This is your race log. You can keep it over many years as you have space for 198 races. Just copy and transfer the data to next year’s blank worksheet. The screen scrolls and saves its place of last view so you don’t have to scroll down to the bottom of the list each time. You record all the information you need, including a VDOT value from Jack Daniels’ Running Formula on the PREDICTOR worksheet. It’s just for your records because conditions vary too much to consider any “trends” to be completely valid. It may be partially true, like increased fitness with time, but it could be more or less pending conditions of your races (weather, course difficulty, etc.). I also don’t include a “predicted” and “actual” space because there is no correction factors (in my simplified use) for the predictor formulae. You can write that out in the comments if you like. A lot of the numerical features recorded in this run log are number crunched and graphed, as you can see below. Sometimes, it’s just nice to see the results over time on a graph rather than looking through the numbers. These graphs appear on separate worksheets, which you can reorder into any order you like (as with any other worksheet), by grabbing the worksheet tab with its name at the bottom of your screen, drag and drop before or after the one you want. 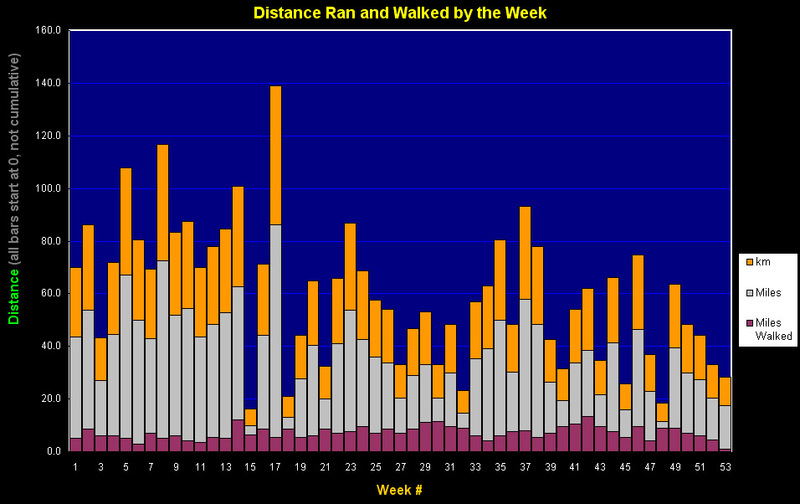 The graph above shows your mileage ran over the weeks, in both miles and kilometers, as well as miles walked. This graph above shows how your pace has changed with time. If you run in a place with truly different seasons, you’ll probably see your pace vary with the temperature as you pile on or take off more clothing to run. The new graph actually has two lines rather than being a bar graph. I just made this change to this year’s log so I don’t have a picture to show it. 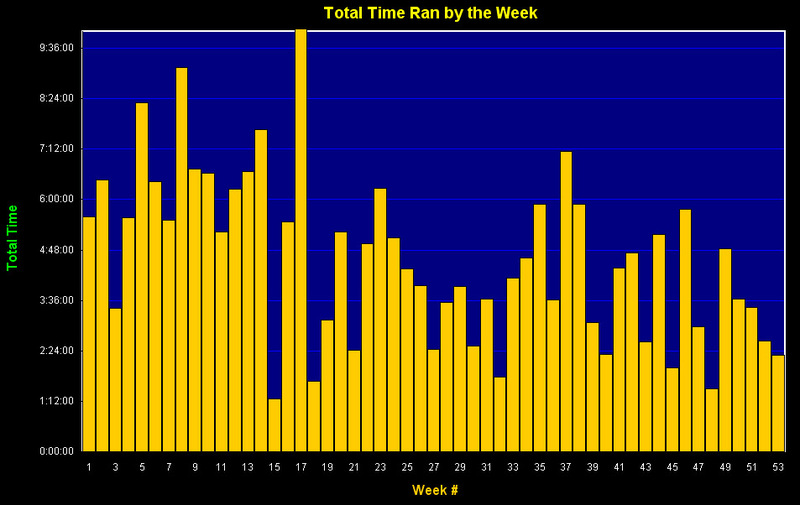 This graph shows how much running time you did per week over the year. This graph shows whatever you choose to record as your alternate workouts, and how they varied over each week throughout the year. 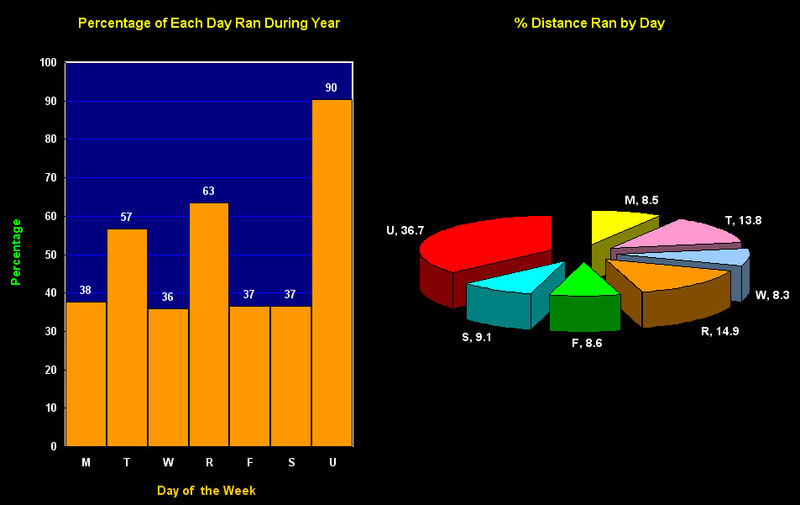 This graph above shows your average weekly running routine with respect to the different days of the week, like how often you ran each day and how much mileage compared to other days. There is also a graph showing how your average weight each week, as you recorded it, changed throughout the year. I just added it to this year’s version of the running log so I don’t have a picture to share. So that’s it. I hope you will enjoy using this log. If you have questions, please leave it as a comment so others can see and possibly benefit from the answers, which I’ll do my best to provide. Enjoy! ← Should NFL Division Winners with Losing Records Be Allowed in the Playoffs? A Poll and Proposal. Thanks! I’ve been using the older version and have loved it and have waited for your updates! I’m very happy to be using your logbook! If you ever need to parse out any update tasks feel free to let me know. I’d be happy to try to contribute to the efforts. Thanks so much for your support and offer, Brian. I had just uploaded a revised log with a couple of edits and some new features, primarily graphing average weight, sums and averages for workouts like biking (only had frequency before) and a British “stones” imperial weight conversion system. It’s not necessary you use this as it’s new features rather than correction of old ones, but if you’re not too far into the log, you might want to try the latest version. My apologies but it’s part of growing software, and it’s hard to try to anticipate everything everyone might want. Spreadsheet is fantastic. I tried to hide some columns on the DATA worksheet to show just the essential columns for me (so I can keep a hard copy) but it seems the sheet is protected. Can you email me the password so I can unprotect the sheet? Appreciate all the work you put into this! Hi Walter, sorry for the late reply. I would prefer to make the changes for you rather than sending out passwords. If it’s not a privacy concern to send me your spreadsheet, I could remove the columns you want and shrink others, after you email it to me. I never intended for the spreadsheet to be printed. You can email me at digitalcitizen at hotmale dot com, misspelled on purpose to avoid spambots picking it up for use. Thanks. This is amazing! I am sure my training is going to improved because of this running log. Thank you! You’re very welcome! I hope it will help improve your training. I also find having things to track helps me hit targets I might not have otherwise set for myself, and just to do things sometimes so I can put it in the log and see the results of all the hard work done. Good luck! Thanks a lot for sharing this spreadsheet. It is great to keep track of record and monitor. I have been using it for a year so along with one more runlog spreadsheet. Thanking you once again for sharing your. For some reason when I enter the distance ran, it enters it as KM automatically, how do i change this to miles? Put “m” (no quotes) in the next column to the right of your number. “m” is for “miles”, to keep it at one letter, even though it is properly the abbreviation for metres. I put “k” for kilometres just to be clear otherwise. This is a really great log. I’m so miserably bad at excel despite my best efforts, and so glad to have it all put together for me. 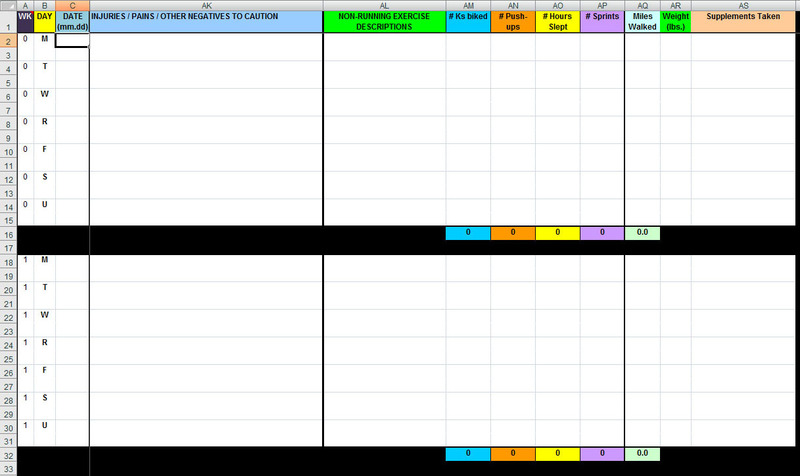 I wish I could add a few columns for other workouts/variables, since I typically like to save the 10 intervals space for track workout intervals, and would love to input values for things beyond just the 4 available spaces. But this is a beautiful thing you have created! Thanks, Melina. If you don’t need the totals, you could always use the second line of each day to give you 8 work out spaces. Yes, it would mess up the totals, but it’d give you a record. Otherwise, you could always use a second version. Just make sure you enter 0 for run miles each day so the weekly totals activate. Or, a bit more tedious, just copy over your mileage each week from the first version. But I thought it’d be enough to have 4 counters. This sounds like a dream, i have maintaining logs in a .xls sheet for over 2 years now. Where do i download this from. I’d like to use it. Will i be able to upload my current logs into this sheet. Hi Ashwini, there is a link in this post (highlighted with the MB size). Clicking on it should automatically start the download, or ask you if it’s OK to download, depending on your browser and settings. As for uploading current logs, I highly doubt it because the data would have to line up. It’s not likely that would be the case, considering I have double day workouts and room between weeks, things would line up. You might be able to put it in week by week or something, but pending how much it’s worth to you to see some analysis, it may or may not be worth your while. You’ll have to decide that. Just enter like a month’s data to see what you get for analysis versus effort, and decide whether it’s worth it. I hope you’ll enjoy using the spreadsheet from scratch, though. Hi Minh, I am trying to find the perfect design to make into a large Fathead mural for my son’s room and I found this image of yours.. pixels, x, wallpapers, wall, papers, university, north, iowa, panthers.. I was wondering if I could have the copyright permission to give to Fathead.. My son is a huge Panther fan and loves your design the best.. Thanks so much! Hi Holly, I don’t own any copyright to the North Iowa Panthers logo. It was on the Internet so I used it to create what I did. You’re certainly welcomed to use my image but to be legally clear, I can’t give something I don’t own, which is copyright on the logo. I can give permission for the image I created so please, go ahead, and I hope your son enjoys it! I work according to a shift duty roster. So could you make the log have 8 day weeks instead of 7 day weeks. I know this does not sound good but if I try to work a plan which is designed for 7 day weeks i simply cannot as my duty will interfere with some days work outs..
Hi Mohamed, I appreciate the challenges of your 8 day shift work week. I’ve trained nurses working on 4 days on 4 days off to have the same challenges. However, at current time, I am way too busy to make the changes you ask. It’s not that simple. I have a suggestion on how you could do this, though. If you have a regular 8 day shift, you should have a regular rest day for running. If this is so, just leave it out of the week. In the set-up, ignore the day names. In the spreadsheet, put in the actual dates for every single day to keep it straight. If you don’t have a regular day off, there are two entries for each day. Make a note on each extra day you have to squeeze in each week. The key thing is this. 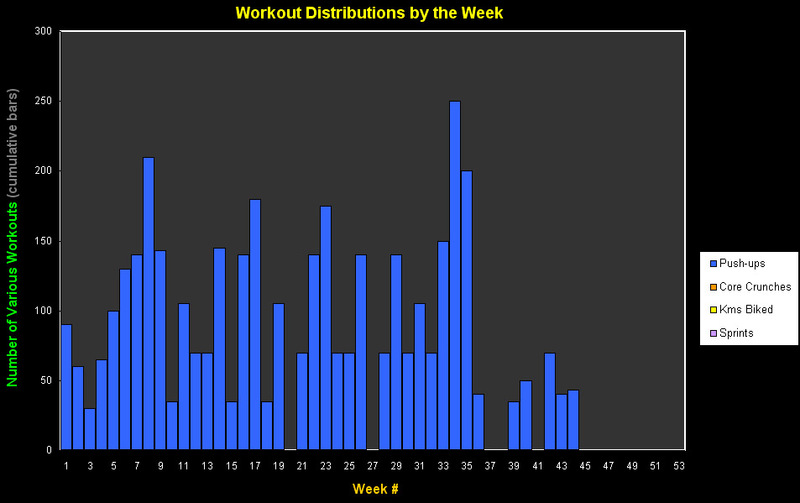 While you may not get the daily workout stats the spreadsheet features, it’s the weekly ones that are important. There is a weekly update total so you don’t need the complete year to get a year’s statistics. As long as you can fit in your runs each week, and there is room for 14 runs, that’s what matters most. Sorry I can’t make something new for you but I hope the advice will help. 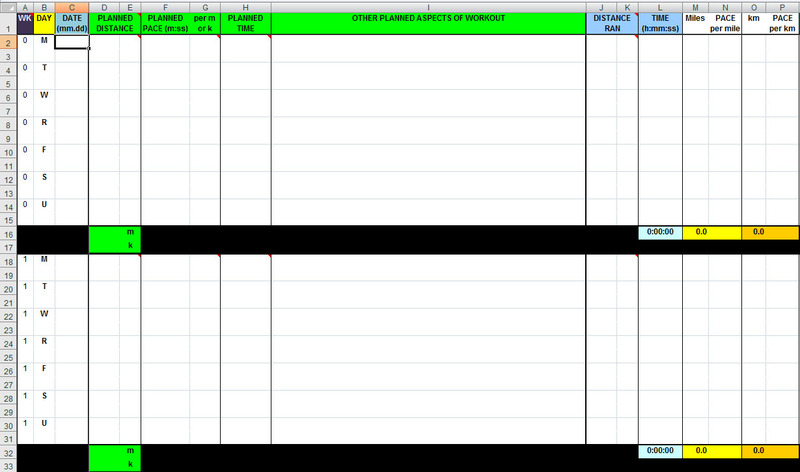 Hi, is there any way to remove the “planned” (green) columns and kilometer columns from the spreadsheet? I don’t use either of those, and since the document is protected it won’t allow me to do this. Thanks so much! You can scroll over to the right and they should disappear as I have it on “Freeze Frame” view. Just use tabs and arrows to move around the cells then rather than returns that brings it down to the last row. You should be able to highlight the column at the top. Only the column title bar will highlight, not the entire thing. Then right click and choose “Hide” to hide any columns you want, though. It works on my protected version. Thanks for this incredibly prompt reply. My excel version (Mac version 11.6.6) does not allow me to hide the column (it is a non-bolded option when I right click). Also, this is a great thing you’ve created. Thank you. Sorry for the minor inconvenience then. I don’t know how to get around that other than to ask to get the file and do it myself and send it back. I don’t want to give out the password for my own reasons. I hope it’ll be helpful in your training. Good luck in your training! Let me know if you want to email it and I’ll send you an email to get it. Hey Minh, I didn’t start the log yet because I kept hoping I would be able to fix it and hide the columns myself before setting it up. So if you send me a version with the columns hidden, that would be fantastic! I can also send you my blank one if that helps. I’ll get you a copy after you answer the email I sent you on any other mods you’d like to have done. I just saw your reply here when I came to download another copy! For some reason I never got your email and it must have gone into spam. But if you email me again I will check my spam folder to pick it out immediately. OK. Just sent it. Sorry to have taken a while to get back. Hi Minh, thank you for making such a great tool! I accidentally started logging in week 0, and now am many weeks into running when I realized that the graphs don’t show it…is there any way to either move all of my weeks down one so my first week starts as week 1, or make Week 0 show up in the graphs? Oh dear, Gabe. Alas, not really any easy way. Things are really blocked off between summary rows and columns that manual COPY (not cut) and paste of the last week one week later, and previous week over that week, for all the columns, one batch at a time, is the only real option. If you wanted some totals with an asterisk, you could always paste week 0 at the very end of the year so it is the anomaly, but it’s there at the end and in all the totals. Then wipe out week 0 with a bunch of zeroes (don’t leave empty). Sorry it’s not what you’d want to hear, but I didn’t factor for that. Let me know if you have other questions. Okay that’s what I was thinking of doing. We’ll see whether it bothers me enough to take the time to do that ;). Also, in the weekly distance ran bar graph, is there a way to delete the kilometer bar (either by deleting it or changing the orange color to the background color), so that I only see the weekly miles I ran? I love this spread sheet and used it all last year but really wish it gave monthly totals as well. Thanks, Callie. I’ve lost the password to this spreadsheet in switching computers somehow so I’m not going to be able to adjust it any more even for myself. Monthly totals would require users to put in dates or at least months with entry. I’m not sure that’s less troublesome than if you were to just mark off the start and ends of the months in the log, add a new worksheet and make a small table there you can add each month. Or just look at the total miles in the year on the last day of the month, subtract it from the total you recorded last month, for a quicker way to go about it. Sorry I can’t help much more than that. I’m thinking of going Garmin and having all these more advanced apps. Lots of other watches have them as well, and they’re becoming a lot more affordable unless you want something really advanced with all the features.